During the second half of the 19th century important changes took place in the world of Art. Romanticism had opened the doors towards a free painting, open to new subject. The social changes derived from the Industrial Revolution, at once with the political revolutions, powerfully influenced on the artist, who questioned their paper in this world of transformations. The fight between academicism and rupture marked the whole century, specially the use of colour, texture and light. Realist painting did not invent anything in formal aspects. Its significance is on the subjects chosen and in the way in which those are treated. Politically it is the century of the bourgeois revolutions. The rich bourgeoisie who controlled the politic did the same with the artistic taste through the salons, in which the artists should exhibit their work in order to be known. Realism ask for the zenith of reality, the importance of daily subjects treated in an objective way, without idealization, in front of the colossal subjects of the past –religion, mythology, allegory, history -. In this sense the Romanticism had paved the way at insisting on the landscape, without myths, and in the popular. The amazing about the realist relies on the subjects, the way of confronting the reality, because the technique is the traditional. They did not idealise the images and people appear in their normal activities. He considered that the function of the painting was to reproduce the reality as it is, free of any philosophical, moral, political or religious prejudice. Some of his works are A Burial at Ornans and The Painter’s Workshop. He realised engravings and lithography and caricatures that criticize the hypocrisy of Louis Phillip’s monarchy. In oil painting he used an energetic brushstroke that gives the impression of draft. His subjects reflected the compromise and solidarity with humble classes as the Third Class Wagon or The Launderette. 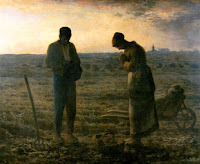 He was the first painter in whose workers are the main protagonists of the work, but always resigned and patient, as in Angelus and Scatterer. The most important artists are Corot and the members of the Barbizon School. They tend to copy on the canvas the reality of French landscape. Corot experienced nature as it is, no as he can imagine it. He capsized the instant, the fleeing light, the changing atmosphere. Some of his works are Chartre Cathedral and Mantes Bridge. Itwas a group of English painters, poets and critics, founded in 1848 by John Everett Millais, Dante Gabriel Rosseti and Willian Holman Hunt. The group's intention was to reform art by rejecting what they considered to be the mechanistic approach first adopted by the Mannerist artists who succeeded Raphael and Michelangelo. They believed that the Classical poses and elegant compositions of Raphael in particular had been a corrupting influence on academic teaching of art. Hence the name "Pre-Raphaelite". They wanted to return to the abundant detail, intense colours, and complex compositions of Quattrocento Italian and Flemish art.